A year ago today, I abruptly stopped editing my Nanowrimo novel to participate in the miracle of having my insides cut open to yank out a tiny human. My writing hiatus ends now, and since this is my third child, I've got a plan for how to jump back into writing. Happy birthday, Linden! Mommy's running off to live with the squirrels! Enjoy your cupcakes. 1. Leave out snacks. Kids like candy, cupcakes, and chips. Remember that tiny humans are still very short (especially if they are MY tiny humans), so you may as well leave the food out in bowls on the floor. 2. Pretend to be deaf. What? I can't hear you! I'm sure that Jimmy can patch his eye by himself. This is how you learn not to hit each other, children. 3. Everything is closed. The other stores heard that Chick-fil-a is closed on Sundays and they got jealous. Marbles, jump houses, and everything else is closed for the rest of the winter. 4. Remove all the clocks. Your kids don't need to know that you are putting them to bed an hour early, and since you're deaf, you can't hear that they need a drink of water after the lights are out. See someone fighting in the middle of the day? Oh, must be nap time! Again! 5. Supply books and DVDs, preferably ones that teach children how to get dressed, make a sandwich, pour milk, mop up milk, vacuum up chips, brush their teeth, nap, apologize for hitting Jimmy, and first aid. "Hunters Unlucky" by Abigail Hilton is a moving, exquisitely complex epic fantasy about a long and bloody feud between the dominant talking animal species of Lidian, the deer-like ferryshaft and the lion-like creasia. Hilton's deep, personal characters, meticulous species and setting development, and continually evolving plot pulls the reader along in constant suspense. This is one of those rare tales that has you constantly telling yourself "just one more chapter" until the beautifully orchestrated ending, 214 thousand words later. 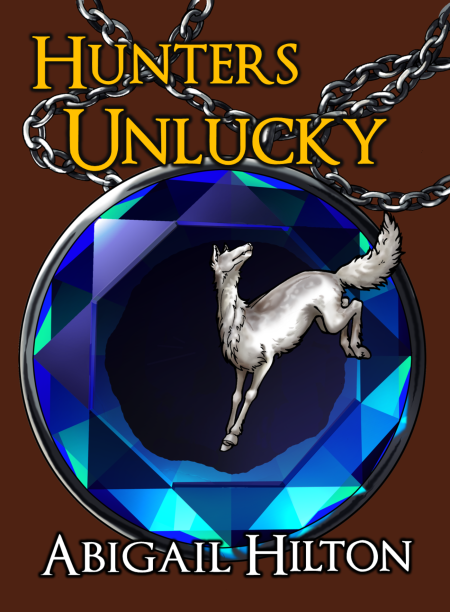 "Hunters Unlucky" is just one of many highly engaging fantasy stories that I've read or listen to by Abigail Hilton. Visit her website at AbigailHilton.com to find out more about the author and her works, which appear in both text and audio formats. He's not bigger. He's not faster. He's not meaner. So he'd better be smarter. Storm is born into a world of secrets – an island no one visits, names no one will say, and deaths that no one will talk about. The answers are locked in his species' troubled past, guarded by the fierce creasia cats. But when Storm's friends are threatened, he decides that he must act, pitting himself against the creasia to show that they can be resisted and outwitted. To prove his point, he must stay one step ahead of clever hunters, who have more to lose than Storm imagines. This 214,000-word novel is DRM-free and carefully formatted.